Born in Paisley, Renfrewshire, Scotland, but living largely in Aberdeen, MacGregor used the McIntosh pseudonym (along with its variants J. T. MacIntosh, and J. T. M’Intosh) as well as “H. J. Murdoch”, “Gregory Francis” (with Frank H. Parnell), and “Stuart Winsor” (with Jeff Mason) for all his science fiction work, which was the majority of his output, though he did publish books under his own name. His first story, “The Curfew Tolls”, appeared in Astounding Science Fiction during 1950, and his first novel, World Out of Mind, was published during 1953. He did not publish any work after 1980. In 2010, following his death in 2008, the National Library of Scotland purchased his literary papers and correspondence. Along with John Mather and Edith Dell, he is credited for the screenplay for the colour feature film Satellite in the Sky (1956). CLICK HERE FOR MORE BOOKS BY J.T. MCINTOSH. I picked up Flight from Rebirth by J.T. McIntosh because it was on sale at Audible. I wasn’t familiar with the book or the author (J.T. 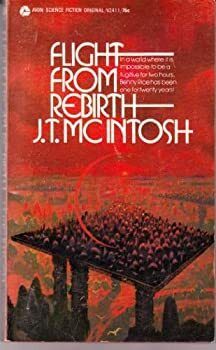 McIntosh is a penname of James Murdoch MacGregor, a Scottish writer). The story is about a man named Benny Rice who appears to be a pleasant mentally challenged man who works at a low-level job in a futuristic United States. It soon becomes apparent to the reader that Benny is a lot more functional than he seems. McIntosh teases us with this until the end — who is Benny? Is he really mentally challenged? If not, why is he pretending to be? Who is he hiding from, and why? Add to that his society’s strange process of Rebirth — reincarnation for the few people who’ve proved themselves worthy to carry on the human genome — and you’ve got quite a mystery.